When Adam Razok escaped from civil war in Syria as a teenager, he was desperate for a new life. He travelled to Lebanon and then Turkey, before boarding a smuggler's boat taking him, and many others, across the Mediterranean to Europe. Now aged 26, he has been settled in Belgium for four years. He has a full-time job as a driver for the elderly, rents his own flat and has a strong network of friends. And he's working to give something back to the country he now calls home. In 2016, he founded a new football team named Syriana, in honour of his birthland. He posted a message saying he was looking for refugee football players - and was stunned when 250 people showed up for try-outs. Forty made the grade, and the club has become a means of helping refugees integrate, with a blend of Syrian, Iraqi, Palestinian, Afghan, African and sometimes even Belgian players. "I wanted to do something in Belgium that shows that we have talented people, to show them that we can do a lot of things and we have good football players and we would like to integrate ourselves into the Belgian society and the Belgian community," Adam said. "I have a lot of friends from everywhere also, it's not only from Syria. So because we don't have families here, so most of the time we hang out all together, we go out to eat and drink something, to go to the shisha bar or something." 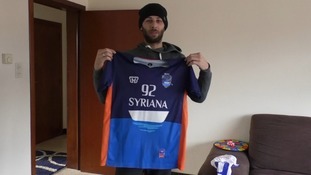 The Syriana logo includes a boat in honour of the means by which Adam, and many of his teammates, travelled to Belgium. But he said he still misses his home, and in particular his family, who settled in Turkey. "Of course I miss my country and I miss all the nice moments that we left behind us in our countries," he said. "But most of the things that I really miss is my family. It's almost five years that I didn't see them." As for whether he will return to Syria should the fighting there end, he said he wasn't sure. But in the meantime, he said he's happy with the family he has created for himself in Belgium, with Syriana.